I am pleased to announce the addition of an experimental new "Performance Likelihood" metric to Golf Predictor. This new empirical metric is based on an examination of the useful Tournament Winners Form page (Other Stats menu) on Golf Predictor. On analysing the tournament winners from the European and US PGA Tours over the past couple of seasons, I noticed that about 90% of them had recorded at least one top twenty finish in their previous six tournaments that season and/or their last six tournaments on the same course and/or the previous six similar tournaments played*. Of the roughly 10% of winners who hadn't registered such a decent recent finish, most of these were in tournaments with traditionally poor fields that are very difficult to call. Any golfer who has won all eighteen tournaments analysed (see above) will have a value of approximately 100% for this metric. This is very unlikely to happen, although Tiger in his pomp would have gotten fairly close at some events! Golfers with no top twenty finishes in all eighteen tournaments analysed will have a value of 0% for this metric. This does not mean they have no chance, only that they are not good picks! Golfers get awarded increasingly more percentage points for top twenty, top fifteen, top ten, top five and wins in all eighteen tournaments analysed. Any golfer with a value greater than zero is a possible decent pick. Anyone with a value over about 20% might be a good pick, over approximately 40% a great pick and you could almost put your house on anyone with a value greater than about 60%! This assumes there is full course history and sufficient season history for the golfer in question. Golfers up near the top of the GP rankings will obviously tend to have higher values, but less consistent golfers further down the list can still have relatively large values (as bad results are ignored). These golfers may make good long shot punts. Like all golf predictions, this metric is more accurate for tournaments with good fields and that are played on the same course every year. Of course, there will probably be golfers at any given tournament with no official course history. The algorithm takes whether there is any course history for a golfer or not into account. If there is no course history for a golfer/tournament, the value will be less accurate, as there is only recent season and similar tournament history to go on. Similarly, the algorithm will not be as accurate in early season events as it will be once each golfer has played six events in the current GP season (calendar year). For many regular events later in the GP season, the previous six events in the same season and the six previous similar events could be very similar. This could lead to artificially high values if someone has a good recent season record ahead of such a tournament. This has been accounted for in the algorithm. The algorithm may need further tweaking, but it looks OK after the first few weeks of testing! This metric has been added to the General panel on the 'Prediction Data' page for each golfer. It has also been added to the main Prediction Rankings page as a sortable column, with the header text PL(%). 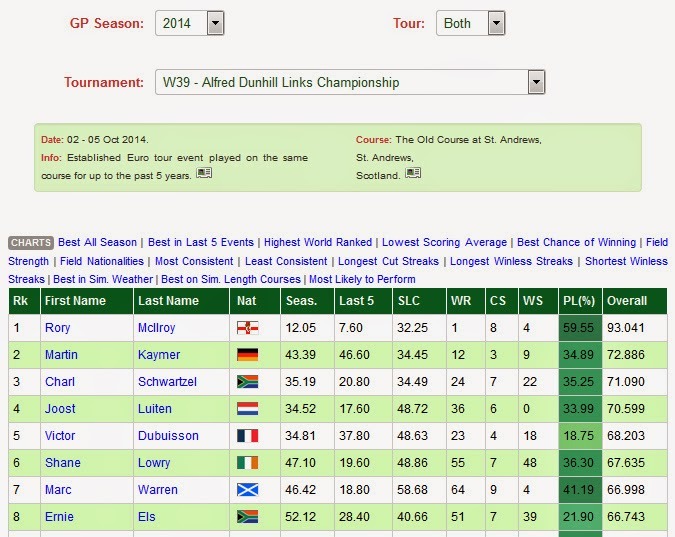 This column has been colour coded with deeper shades of green representing higher values, as shown in the screenshot above for the 2014 Alfred Dunhill Links Championship. Incidentally, the value for Rory McIlroy is the largest calculated so far and he came tied second in that event (and possibly would have won it if he hadn't putted into the road hole bunker on the 71st hole!). The less useful similar weather column has had to be removed from the Prediction Rankings page to make room, but it is still available on the Odds version of the page (Predictions menu). There is also a new "Most Likely to Perform" chart on the Prediction Rankings page, which shows the golfers with the highest value in this new metric graphically. I have also added this new metric to the Field Rankings page and the two Compare Field Rankings pages on the Prediction Menu and added it to the associated charts on those pages. Note that this new metric (and associated chart) is not available prior to week 39, 2014 (the week of the Alfred Dunhill Links Championship/week before the start of the 2014/15 US PGA Tour season). You may have to refresh an updated page to see the changes. I trust you will find this new premium feature useful. Any feedback (via comments on this article or email) on the value itself or the colour coding would be most welcome. Like other premium features, non-subscribers can only see this new metric for golfers ranked 11-25 in the prediction rankings and will not be able to see the new chart. Therefore, sign up today and reap the full benefits of Golf Predictor, the premium professional golf statistics site. *Only the course and similar tournament history in the current and previous five seasons is used in the algorithm. This new metric is starting to pay off already. Used it to spot winner Streb, whom I tipped and backed for The McGladrey Classic at 66/1 each way!